Workshare - How to compare PowerPoint presentations? This illustrated tutorial shows you how to quickly and accurately compare two PowerPoint presentations in three steps using Workshare Compare, which you can trial for free. With Workshare Compare, you have market-leading DeltaView technology available in a click, giving you fast and accurate comparison. Choose any two PowerPoints and generate the comparison. It clearly displays all changes (from slide order and content) so you can be confident you're not missing any small changes that might make a big difference. See Ryan, our Director of Product Management, talk about it in this video about Compare for PowerPoint. These steps will be familiar to you if you’ve ever used Workshare to compare PDFs or Word documents because the process is almost the same. 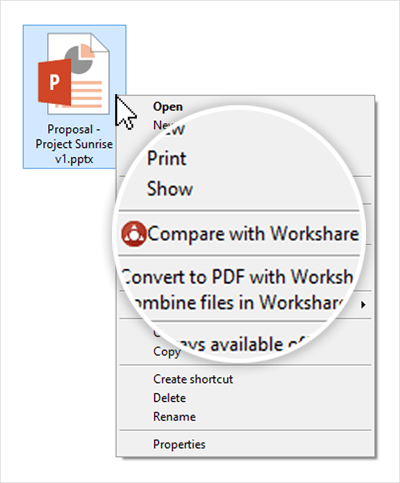 Step 1: Right-click the first presentation and select Compare with Workshare. Ideally, choose the presentation that was created first. Whichever presentation you choose now will be designated as the original presentation. If you select the presentation that was created second, don’t worry – later on you can use the Swap tool to change the order of the two presentations you’re comparing. 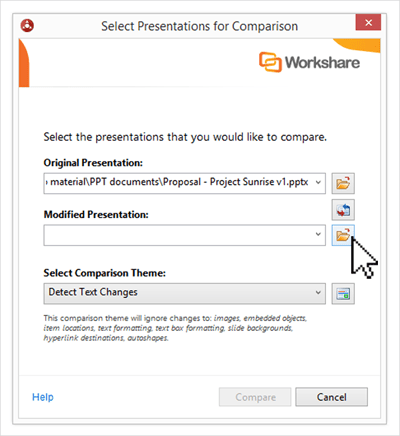 When you click Compare with Workshare, the Select Presentations for Comparison dialog opens. Step 2: Choose the second presentation. Click the folder selection icon to the right of the Modified Presentation field. Navigate to the presentation in your DMS/CRM, in SharePoint or on your local file system and click Open. Tip! If in Step 1 you selected the presentation that was created second, you can swap the two presentations now using the Swap button located between the folder selection icons for the original and modified presentations. You can change what types of changes are included in the comparison (Speaker Notes, Image Content, Slide Backgrounds, etc.) and what colors are used to display changes by modifying the Comparison Theme. To do so, click the comparison theme icon to the right of the Select Comparison Theme drop-down. 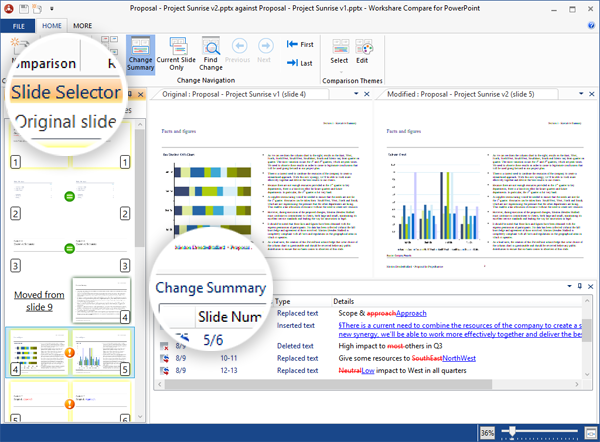 When you click Compare, the Workshare Compare for PowerPoint application is displayed showing the changes between the selected presentations. The Slide Selector is on the left. 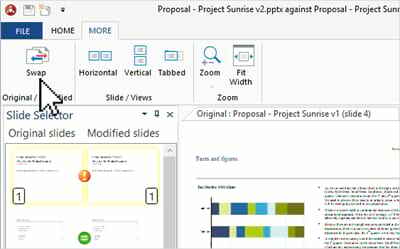 It gives you a high-level view of the differences between the presentations and enables you to jump to any slide pair in the Slide View, so you can see changes in detail. An exclamation mark is displayed between slide pairs with differences and an equal sign is displayed between slide pairs that are the same. The border color of the slides indicates whether the slide is new (blue), deleted (red), moved (green, and the new position is indicated) or has content changes (yellow). The Slide View is on the right. It displays a larger view of the original and modified presentations with any changes clearly indicated, enabling you to scroll through the two presentations and see changes in context. The Change Summary sits below the original and modified presentations. It provides a list of all changes in the order in which they occur. Select any change from the Change Summary to see it in context in the Slide View. Tip! Want to filter out the noise? Click Show Changes in the Home tab to see only the slides that have changes. If the changes you were expecting to be added are displayed as deleted and vice versa, it’s because your Original and Modified presentations should be swapped. When you’re in the application, you can do this by clicking the Swap button in the More tab. 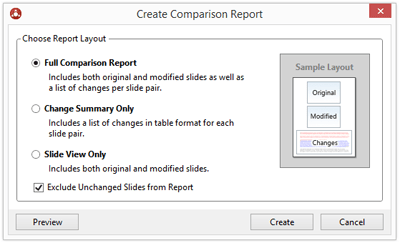 You can create a report showing all the changes between the two versions of your presentation. The report is a PDF that you can save or share. Click Create in the Home tab. Full Comparison Report: Includes the original and modified slides as well as a list of changes per slide pair. Change Summary Only: Includes the list of changes in table format for each slide pair. Slide View Only: Includes the original and modified slides. Select the Exclude Unchanged Slides from Report checkbox if you only want to include slides with changes. In the save dialog, browse to a save location and enter a name for your report. Click Save. 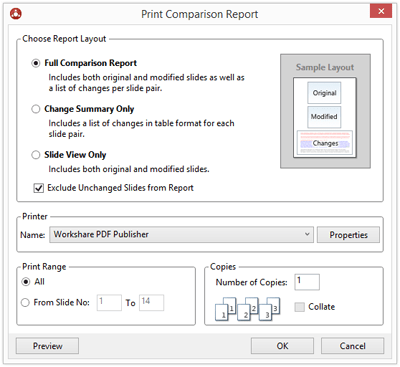 The comparison report is generated and saved as a PDF. Equally, you can print the report showing all the changes. The steps are similar to creating comparison reports. Click Print in the Home tab. Select the Exclude Unchanged Slides from Report checkbox if you only want to include slides with changes in the report. In the Printer area, select which printer to use. In the Print Range area, select whether to include all slides or selected slides. In the Copies area, enter how many copies of the comparison report you want to print and select the Collate checkbox if collating multiple copies is required. Click OK. The comparison report is printed. The Workshare Professional 10 User Guide is a great resource for full details about all of the features available when comparing PowerPoint presentations, including how to create comparison themes, search for changes and more. We hope Workshare Compare helps you power through your review cycle so you can slide right into whatever you have to do next! If you would like to receive product updates, event invitations and other thoughtful content from Workshare, please subscribe to our mailing list, and we promise never to share your information with anyone else.